The phrase "jump the shark" is usually employed in relation to the moment when TV shows go from awesome to awful, but it could equally be used to describe the song that ruins a music act's career. This week in 1984, one of the biggest bands of the previous couple of years debuted with a single that was arguably the sound of them jumping the shark. Yes, it almost got to number 1, but it's viewed fairly dimly these days and was followed by a rapid fall from grace. The song that blocked our jump the shark single from the top spot for three straight weeks was at number 1 this week in 1984. "I Just Called To Say I Love You" by Stevie Wonder spent its third of eight weeks on top. His last solo album, 1981's Law And Order, produced number 1 hit "Trouble", but this lead single and title track from Go Insane placed the Fleetwood Mac member at the opposite end of the chart. We saw brother Robin make the top 50 a few weeks ago, but Barry Gibb had no such luck with this genre-blending first single from his debut solo album, Now Voyager. Pop stars and movies are an unpredictable combination. And for every Purple Rain, there's a Give My Regards To Broad Street, which saw Paul McCartney play a version of himself on the big screen for the first time since his days in The Beatles. But while the movie itself was pretty widely panned, the soundtrack did quite well. Mostly containing new versions of songs from throughout Paul's career (both solo and with The Beatles), the album also featured new track "No More Lonely Nights", which became Paul's first non-duet top 10 hit since 1980's "Coming Up". It would be the last time he'd get anywhere near that high on his own, but of course featured on two top 10 hits (with Kanye West, and Kanye and Rihanna) in 2015. Since their breakthrough with "Do You Really Want To Hurt Me", Culture Club had enjoyed a stellar chart career, with four top 5 singles and two other top 20 hits to their name. 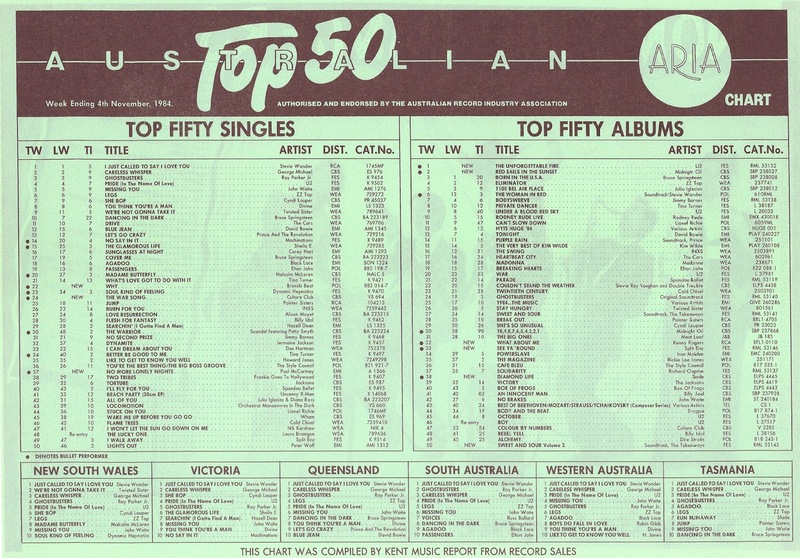 The lowest they'd reached on the ARIA chart in that time had been the number 26 peak of "Miss Me Blind" - the fifth single from their last album. So it was little surprise that brand new recording "The War Song" rushed straight into the chart at number 24 and had jumped to number 2 within two weeks (and stayed there for three weeks in total). But despite its success, "The War Song" is credited with ruining Culture Club's career. First there was the song itself and its simplistic "war, war is stupid and people are stupid" refrain. Yes, there was a serious point in there somewhere about the glorification of armed conflict, but the childlike approach to its subject matter undermined any attempt to make a statement. Then there was the overblown Russell Mulcahy-directed music video. New bright red hair! Combat wear as runway apparel! Fright wigs! Stacks of kids dressed as skeletons! A tank! Perhaps what Culture Club needed was someone who'd say "no" every once in a while. Don't get me wrong - I actually liked "The War Song" at the time, but I was nine years old. And while I still don't mind it, I can see why it dropped out of the chart just as quickly, lasting just 12 weeks in the top 50, which for a song which spent three of those weeks at number 2 isn't great. A similar fate befell the album, Waking Up With The House On Fire, which also peaked at number 2, but spent just 16 weeks on the top 100 compared to the 68-week tally of Colour By Numbers. Perhaps if Culture Club had better material to follow "The War Song", it might've been viewed as an attention-grabbing novelty in the midst of their otherwise high-quality pop. But Waking Up... is generally considered substandard and rushed. And follow-up singles "The Medal Song" or "Mistake No. 3" (depending which country you lived in) weren't up to much, and performed accordingly. Bounding up from number 54 to enter the top 50 two places above "The War Song" was the latest from synthpop trio Bronski Beat, whose previous single "Smalltown Boy" dropped out of the top 50 this week. Like its predecessor (and "The War Song"), "Why?" was a song with a political point to make - once again speaking about homophobia. The difference between Bronski Beat's approach and that of Culture Club couldn't have been wider (and not just because of their music videos' respective budgets). Subtle (well, compared to "The War Song") and a sophisticated pop song, "Why?" still resonates today. After two top 10 hits in a row, Bronski Beat would fare considerably less well with their next two singles (covers "It Ain't Necessarily So" and "I Feel Love (Medley)"), but would revisit those highs in early 1986 once singer Jimmy Somerville had moved on to form Communards. "Smalltown Boy" and "Why?" would also return to the chart - kind of - when both were worked in to "Tell Me Why" by Supermode in 2006. Next week: new singles from two of the biggest acts on the planet, the follow-up to the number 1 record of 1983 and the first hit for a two-hit wonder band. I know I'm in the minority but I think 'The War Song' is the best thing Culture Club ever recorded. I don't see it as simplistic, as the lyrics in the verses are quite complex. There are many "moments" in the song that are greater than the chorus, but especially the build-up of Helen Terry's wailing and the "after the bird has flown, he walked ten thousand miles back home" couplet. It might be trite, but it's pop music, so I don't mind if the message is a little jumbled. The video is overblown, but it's prime eighties. I like the blue frightwig. I also think 'No More Lonely Nights' is Paul McCartney's best non-Beatles single, another minority opinion. Yeah I don't mind 'The war song' either. Has a nice melody, has the New Wave/reggae influences within the song & Boy George looked more of a drag then ever before. Unfortunately things went down from here on in. I liked a couple of songs from the next album as well, which a couple of singles became hits. I think that intro of 'Why?' has become notoriously memorable, thanks to Jimmy's slightly infuriating falsetto. Unfortunately it doesn't receive airplay on the classic stations, same goes for 'The War Song'. Great song though with that Hi-nrg/synth beat to go along with it. I really enjoy most songs he did with Bronski Beat & The Communards. I actually love the 'Waking Up with the House on Fire" album. Mistake No. 3 has George in fine vocal...and I always loved The War Song, video and all. My mom and I screamed when we saw the video the first time and they flashed on his red red hair! I read in an issue of "Record Collector" magazine an article about Culture Club (along with an interview with Boy George) which said in it "By the time of '..House On Fire" it was all about George's hat!". From what I gather in the article, George and Culture Club's drummer had been a fairly steady item but the relationship was going sour by that time as George got more and more into drugs and obsessive about his look. It was a very interesting read. Also in that issue was an interview with Marylin Manson. Actually that whole issue was good, but it was from 1998 or 1999 and I haven't read it in over 15 years. I should track down a copy! I loved "The War Song" back then and still love it now. George has publicly stated that he failed at trying to create his generation's "War (What Is It Good For?)" and that the whole "Waking Up..." album was rushed. However, after ignoring it for decades (and leaving it off their 1998 Greatest Hits album) the group has re-embraced it and now play it in most of their shows. It's a fun song! 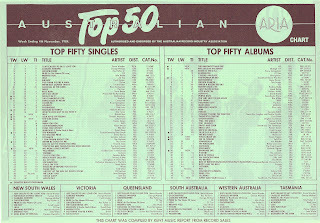 Subsequent singles were weak, though, and charted accordingly. As for George, I don't think he was into drugs in 1984 when this was recorded - that happened during their hiatus in 1985 and by 1986, he was barely able to keep it together long enough to record the vocals for "From Luxury To Heartache".